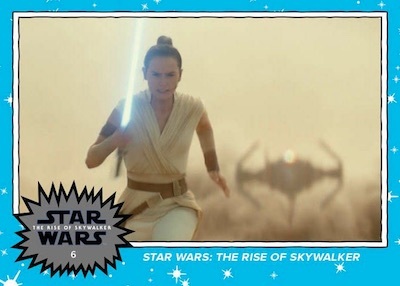 After the first trailer for Star Wars: The Rise of Skywalker dropped on April 12, Topps wasted little time releasing the 2019 Topps Star Wars Rise of Skywalker Trailer trading cards. Episode IX closes out the rebooted sequel trilogy and the overall nine-film run (a.k.a. the Skywalker saga). Sold for just one week, the exclusive set is only available for direct purchase through the Topps online store. 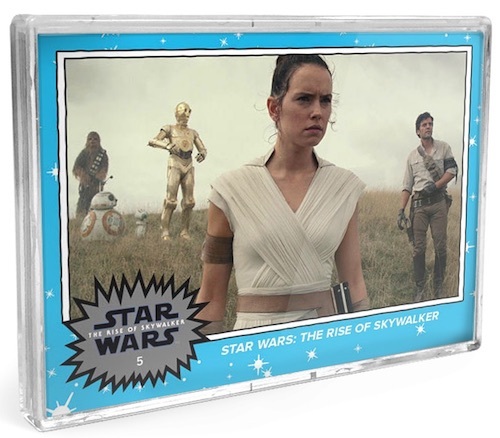 Issued as a full set, 2019 Topps Star Wars Rise of Skywalker Trailer delivers exactly what you might expect. The 10 cards document key scenes shown in the trailer. Heavily centered on Rey, there are mostly familiar faces in the lineup except for D-O, the new robot that resembles a cone atop a hamster wheel. 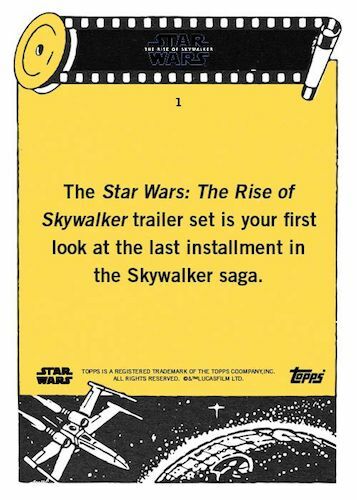 Like most of Topps' online sets, 2019 Topps Star Wars Rise of Skywalker Trailer is done in a print-to-order style. This means the final production amount is limited to how many sets are ordered during the selling period. Buy available Star Wars cards on the Topps site. Featuring stars and a light-blue color, the retro design is common to Topps Star Wars sets over the years. If you worry that the backs might spill some extra secrets about the film, they do not. The full 10-card set sells for $9.99 and includes free SmartPost shipping. Sales end on Friday, April 19, 2019 and final print runs are revealed after that. 10 cards. Shop Rise of Skywalker Trailer cards at Topps.